The Pope and the Wild West. It was a red letter day yesterday for the Eternal City and the North American Indians and the cowboys and Colonel Cody. The halls of the Vatican were crowded with all the blazing emblems of Pontifical glory. The Holy Father received the sons of the Wild West and accorded them his benediction. The enthusiasm was so great that the redskins could only with great difficulty be restrained from bursting forth into an ecstatic war hoop. 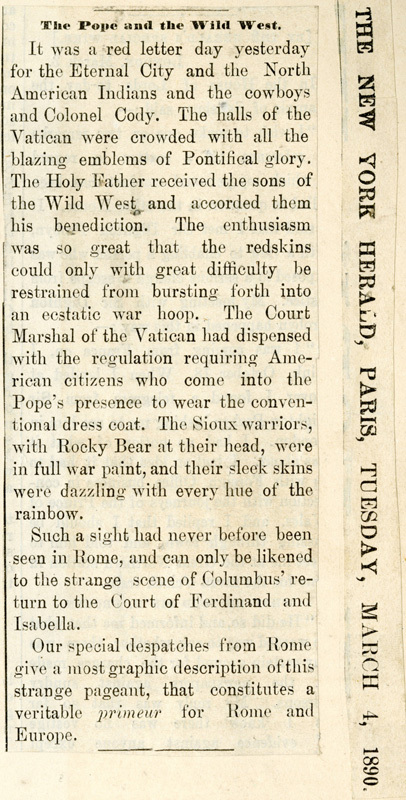 The Court Marshal of the Vatican had dispensed with the regulation requiring American citizens who come into the Pope's presence to wear the conventional dress coat. The Sioux warriors, with Rocky Bear at their head, were in full war paint, and their sleek skins were dazzling with every hue of the rainbow. Such a sight had never before been seen in Rome, and can only be likened to the strange scene of Columbus' return to the Court of Ferdinand and Isabella. Our special despatches from Rome give a most graphic description of this strange pageant, that constitutes a veritable primeur for Rome and Europe.